Do you and your guy define your style as edgy and unusual? You may want to check out this local casual wear brand's latest collection when updating your summer wardrobe. If the latest summer trends you've seen here in Cosmo.ph's Trend Alert section so far still do not quite match your rather unusual and borderline avant-garde sense of style, then this runway gallery of the latest collection from Human just might do the trick. The local fashion brand took us back to the '90s--an era you probably adored for its edgy fashion--and gave us a smashing comeback of the grunge and street style trends. Human presented their “Black Human” collection at Philippine Fashion Week Spring/Summer 2012 collection in SMX Convention Center along with sister brands Kashieca and Bench (watch for the latter's summer collection here soon!). The collection had a grunge and model-off-duty feel, but with a fresh summer touch. 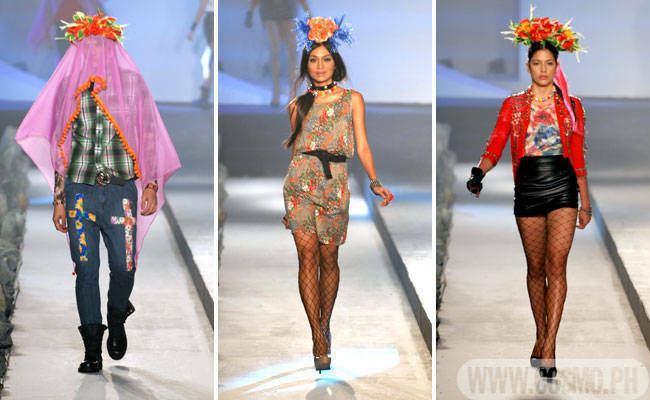 Think layers of floral, leather, plaid, and graphic printed clothes, complemented by fishnet legwear and eye-catching headpieces. If prints and color are really not up your alley, Human also offers minimalist pieces in simpler structures and dark colors like charcoal and black. Meanwhile, your guy would love the tees, plaid shirts, and stylishly derelict jeans in this collection. While the models were exaggeratedly styled, the individual pieces are actually wearable and perfect for your summer wardrobe. Launch the gallery to see Human's latest collection, which you can now snag in stores.